I cut the giant zucchini in super thick slices and hollowed out the center to create bottomless bowls. I made a wild spin-off of the couscous filling and turned it into a nutty tomato-ized quinoa stuffing with chopped dates, apricots, and sun-dried tomatoes. The cinnamon and light cumin and coriander along with the sweet fruit accent bring me back to the markets, medinas and alleys of Morocco, during my 2004 trip. It was an intense time! I had to bake these longer than usual because of the thick zucchini slices. I also made a sesame lemon cheeze sauce to drizzle over the top of the baked wondersquash. The end result: Absolutely, plate-licking fantastic. 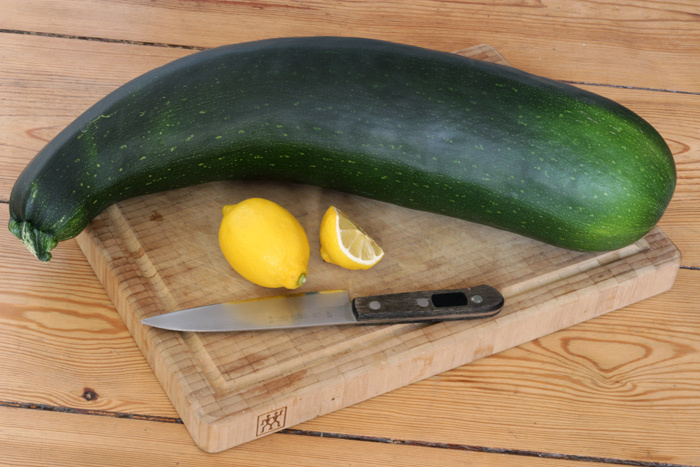 Cut squash in very thick slices or halves. Remove soft insides with spoon to end up with 4-8 “rings” or hollowed halves. Lightly oil, place squash on baking tray. Roast in oven for 20 min. Heat olive oil in a large pot on medium heat. Add onion, garlic, ginger, cumin, coriander, pepper, cinnamon, paprika. Fry until onions are lightly browned, about 2-3 min. Add quinoa, tomato paste, turmeric. Stir several times, fry 1-2 min. Add water + veg broth powder, salt. Stir well, Bring to low simmer, reduce heat to low, cook partially covered, until liquid is absorbed, about 15-20 min (7-10 min with couscous). Turn off heat. Add ground sunflower seeds, nutritional yeast flakes, dried apricots and dates (or raisins), sun-dried tomatoes. Mix well. Let sit for 10 min covered. Fill pre-roasted squash with stuffing. Cover with bread crumbs, patted down lightly. Roast in oven until squash is cooked, stuffing is dark golden brown, crispy on edges, about 35-45 min. Drizzle with tahini or Sesame Lemon Cheeze Sauce (below). Garnish with chopped fresh parsley, mint or basil leaves. Sprinkle with paprika and serve! Heat margarine (or oil) in a small sauce pan on medium low heat. Add soy milk and bring to low simmer. Stir in sesame seeds, nutritional yeast flakes, turmeric, soy sauce, lemon juice + zest, agave, salt. Return to low simmer. Whisk corn starch in water until smooth. Stir into sauce, slowly. Continue to stir and simmer until thickened, 3-5 min, adding more water if necessary. Turn off heat. 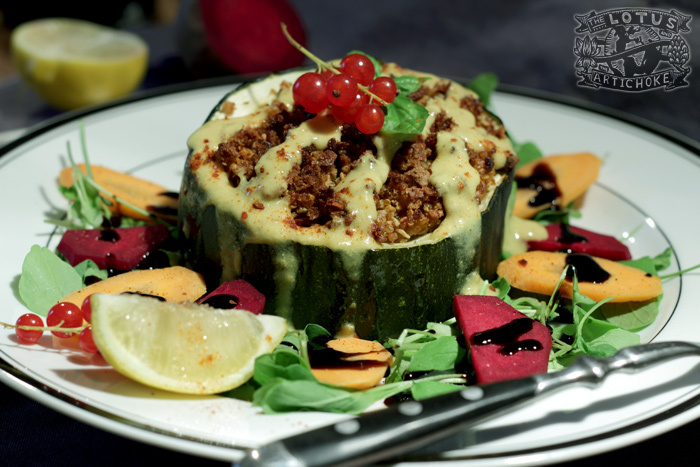 This entry was posted in African, Moroccan and tagged Moroccan, squash, vegan, zucchini. Bookmark the permalink.